1. In a bowl, combine the liquid ingredients of soy sauce, white wine, lime juice, olive oil and sesame oil. Whisk or stir to blend. Add the solid ingredients of garlic, ginger, shallot, cilantro, and red pepper into the bowl and mix. Place Haskell’s Tuna Medallions into the marinade, being sure to coat and submerge the Tuna completely and allow to marinate for 15 minutes refrigerated. 2. Preheat grill or sauté pan to medium high heat. 3. Remove Tuna Medallions from the marinade and the remaining marinade can be reserved to make a finishing sauce if desired by quickly heating it to a boil and then removing from heat. 4. 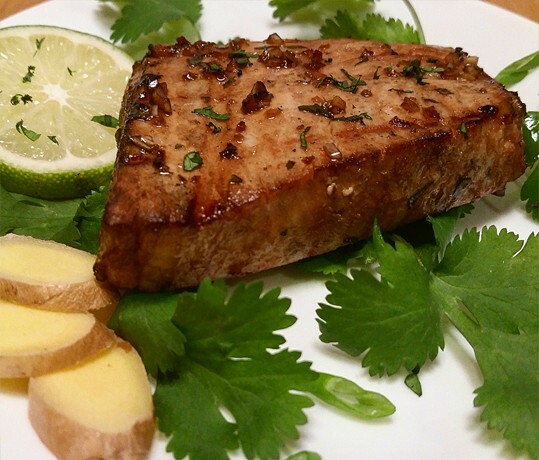 Grill or sauté Tuna Medallions for about 2 minutes on each side. Transfer the Tuna to plates and serve with accompaniments such as broccoli, red potatoes, or salad.